“Starting from 2002, after the US unilateral withdrawal from the ABM Treaty, which is an absolute cornerstone of international security, the strategic balance of forces and stability, the creation of the US global missile defense system has been continued persistently,” said the Russian president. According to him, this poses a threat not only to Russia’s security, but also to the entire world — just because of the possible disruption of this strategic balance of forces. “I think this is harmful for the United States as well, because it creates the dangerous illusion of invincibility,” Putin said. Russia, like other countries, feared that the U.S. would come to believe that it could launch a large first strike against Russia's strategic weapons and use its missile defense to prevent being hit by a smaller Russian retaliation strike. This upset the balance of Mutual Assured Destruction that has prevented a large scale nuclear war. The global missile defense system the U.S. installed proved to be largely incapable. Out of a total of ten carefully choreographed tests five failed completely, the others were largely unrealistic. Still, the issue prevailed and the U.S. kept expanding its missile defense projects. In consequence Russia started research programs to create new weapon system that would be immune to any missile defense. President Putin introduced the new weapons in his state of the nation speech in March 2018. The systems include hypersonic weapons, nuclear propelled cruise missiles and extreme long range torpedoes. All experts agree that there is currently no possible defense against the new Russian systems. Yesterday the Trump administration issued the Missile Defense Review (pdf) report as mandated by Congress. The MDR report is more hawkish than the last one (pdf) issued in 2010 under the Obama administration. The technical plans therein did not change much. The new review mostly foresees more research into some crazy projects, like space based lasers, that are unlikely to ever be deployed. Potential adversaries are investing substantially in their missile capabilities. They are expanding their missile capabilities in three different directions simultaneously: increasing the capabilities of their existing missile systems; adding new and unprecedented types of missile capabilities to their arsenals; and, integrating offensive missiles ever more thoroughly into their coercive threats, military exercises, and war planning. The review goes own to justify an expansion of missile defense even though it is clear that there is no defense against the new Russian and upcoming Chinese systems. We are committed to establishing a missile defense program that can shield every city in the United States. What Trump is aiming at is a replay of the Reagan era Strategic Defense Initiative, derisively nicknamed Star Wars. It included some crazy weapons like the "rods from god", telephone pole size tungsten projectiles thrown from space. The cost to put 1 kilogram into low-earth orbit are some $5,000-$20,000. Those are just the transport costs, not the cost of the more expensive high tech load. A missile defense layer in space that would cover the full surface of the earth at any time would require thousands of systems, each weighing several tons. Low flying satellites require permanent replacements. They can be shot down by Russian and Chinese anti-satellite weapons. Any such program, if technically feasible which it is not, would ruin the United States. The Reagan wannabe currently ruling in the White House may soon revive Reagan's Strategic Defense Initiative, aka "Star Wars", which was first launched in 1984. SDI was the expensive but unrealistic dream of lasers in space and other such gimmicks. Within the SDI the U.S. military threw out hundreds of billions for a Global Ballistic Missile Defense which supposedly would defend the continental U.S. from any incoming intercontinental missile. The program was buried in the early 1990s. One son of Star Wars survived. It is the National Missile Defense with 40 interceptors in Alaska and California. It has never worked well and likely never will. If NMD would function as promised there would be no reason to fear any North Korean ICBMs. Missile defense is largely a fraud to transfers billions of dollars from U.S. taxpayers to various weapon producing conglomerates. I expect that the North Korean "threat" will soon be used to launch "SDI - The Sequel", another attempt to militarize space with billions thrown into futuristic but useless "defense" projects. It will soothe the Pentagon's grief over the success North Korea had despite decades of U.S. attempts to subjugate that state. The first country the new Missile Defense Review names under "Current and Emerging Missile Threats to the American Homeland" is of course North Korea. It is followed by Iran, Russia and China. Iran's Supreme Leader, Ayatollah Ali Khamenei, has restricted the range of ballistic missiles manufactured in the country to 2,000 kilometers (1,240 miles), the head of the paramilitary Revolutionary Guard said .. It is likely that National Security Advisor John Bolton, who in 2001 was behind Bush's pull out of the ABM treaty, pushed to include Iran in the Missile Defense Review. Anyway. Little will come from Trump's dream of new toys except a stream of revenues for the research laboratories and weapon manufactures that will think up the most crazy systems, but will ultimately fail to achieve Trump's aim. Russia has shown how even a working missile defense can be circumvented and others will follow its path. The U.S.' "illusion of invincibility" is just that. But as the Saker has pointed out, there is no defense against a US or Russian nuclear strike. Be prepared for hopeful European resistance against this war mongering exterminism by Trump, who contrary to media portrayals wants to shore up NATO with more funds and inject fracking, GMOs, poison into the Eurozone via TTIP 2.0 and threats. Green left should try to activate remaining networks while drawing younger people into the cause of peace: advocating leaving EU, NATO, and ditching nuclear systems. We'll be called Putin's useful idiots but better that than believe in the goodness of an Empire ran by Gold Plate McDonalds "Dotard" Trump. @1 the narrative that nuclear weapons can be "blocked" was always a form of psychological warfare to get people tho think that missiles systems would make them more safe, in reality they make nuclear war far more likely, ensuring a genocide of Russian people while also affecting Americans if they fail (which they will), with Europe as collateral damage. "war is a racket" as the saying goes. it's usually less about actual capability than it is keeping all the usual suspects latched firmly on the "military industrial" teat. it's basically the world's largest welfare program disguised as "national defense" and - coupled with financial fraud/smoke and mirrors - what props up the sad remnants of the US. unless people believe the insane overvaluation of tech firms like facebook and amazon for another generation. it is also - like you and others have mentioned - an offensive system allowing for first-strike capability and not feasible for many reasons (not the least of which is the sheer amount of "space junk" floating around in orbit.) all it takes is one russian/chinese/belgian/? missile getting through anyway...unless these idiots still agree with bush sr's idea of "acceptable losses of entire cities". 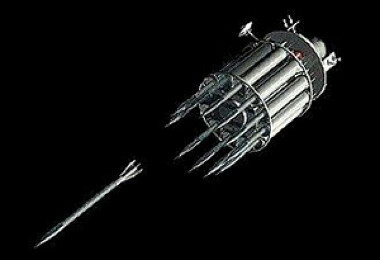 The thing that always bothered me about space-based weaponry was a missile "defense" that works by aiming at a stationary target, i.e., the launch pad. This appears to be doable, and much cheaper if you don't mind openly militarizing space. Sophisticated nuclear weaponry is much easier to lift than mere KE weapon systems. And as far as maintenance goes, why else does the US have a shuttle? If this is true, anti-satellite capability will be deemed an immediate vital threat, requiring extreme action. Why not spread a huge trampoline over the US and bounce those missiles back to their origin. That is probably more feasible than the theory that because the US has a 10 to 4 preponderance of nuclear weapons over [say Russia] then the US can destroy Russia 10 times over, whereas the Russians can only destroy the US 4 times over. Some crazies think those odds are good. This kind of thing must give the Demtards some major cognitive dissonance (insofar as they have any cognition). They're the worst jingoes in wanting to push the confrontation with Russia to the very brink and beyond, so they would be the normal target audience for this kind of sham "missile defense" propaganda, certainly if a Democrat or less hated Republican president proposed it. But they have such Trump Derangement Psychosis, they'll have to denounce this even though it's for their yearned-for nuclear war. As for the SDI technology, they'd be better off with Opus's proposal to put a thick ring of $1000 bills in space to block the missiles. Might work for asteroids and flying saucers too. Protection rackets reach new heights. Trump was again making a public demonstration that he is an ignorant loudmouth. I skimmed that Missile Defense Review and saw the equivalent of a research paper written by a lazy college student. Huge margins, many space-eating illustrations, and much repetition helped to "catapult the propaganda". It was 108 pages of nonsense designed to give the impression we need to throw more taxpayer money to Big Weapons Companies. The cost to put 1 kilogram into low-earth orbit are some $5,000-$20,000. I'm afraid these numbers are seriously outdated. This graph shows the declining costs of launching people and cargo into space. Unfortunately those "rods from god" don't have to be the size of telephone poles. A 2 inch thick and 72 inch long bar of tungsten moving along at 2 miles/second would destroy any armored vehicle it hit, and also a great many other things. If one of them struck the generator at the electrical power plant, there isn't going to be any electricity from that plant for a long while. I don't know why these things haven't been deployed, but it might come down to common sense and low profit. The US has opened a can of worms with weapon-carrying drones, and doing this with a simple and inexpensive orbital weapon might have been recognized as 'undesirable'. Big Weapons Companies don't stand to roll in the big bucks like they do with the USS Ford or the F-35. And possibly nobody could make them work. I just don't know. Once again, that new Missile Defense Review was a combination of really stupid and amazingly dishonest. It could also get us all killed well before the worst effects of climate change arrive. Will the captive Corporate Media ever free itself to the extent that the American voting public will be thoroughly educated as to the costs to the social fabric that these monstrous military projects entail? -- to healthcare, to the infrastructure, to education, to Social Security, and the list goes on and on. Do the warmongers think that nuclear winter is bogus? The US is being actively bankrupt by the elite afraid of losing empire. Well, as long as the government stays shutdown, this proposal's going nowhere. As for the feasibility of such a system, the performance of Russia's anti-missile defense systems seem to say such a system is feasible for non-hypersonic targets, which is what its S-500 and S-600 series of anti-missile systems are designed to neutralize. Also, the Peresvet laser weapon system was one of those announced by Putin last March. Although its capabilities have yet to be revealed, it's likely the precursor to systems capable of defeating hypersonic weapons. Of course, no system is 100% infallible, meaning some amount of hypersonic nuclear warheads will still impact, although it's likely 100% of conventional warheads could be intercepted if such a system was dense enough. As I've written previously, Russia's already far ahead in what has yet to become a race and seems to be sharing expertise with China in this area. "The original nuclear winter research predicted that a war fought with the nuclear arsenals of the 1980s would create temperatures colder than those experienced at the height of the last Ice Age 18,000 years ago. This would leave the Earth virtually uninhabitable. The recent research found that the original studies actually underestimated the consequences of nuclear war." Looks like Russia and China's plan to do a reverse USSR bankruptcy on the US is bearing fruit. Putin's announcement of all those advanced weapons, few of which are actually being rolled out, was just what the US MIC was looking to push for the next round of juicy R&D contracts. It could almost have been made to measure for hungry DC lobbyists. Maybe it was. US debt is growing exponentially, until it doesn't. What then? The Yugoslavia solution, 50 odd countries from the no longer united states? star wars won't work for a number of reasons, but it does ramp up the tension and make war more likely (and make defense contractors and politicians and retired generals wealthier). @16 john mk.. one wonders how much of this is being driven by the same people? good comments on your part either way... i like the reverse engineering re the 50 states, lol.. Yes, it's possible Putin's 1 March announcement was a counterattack in the Hybrid Third World War aimed at the fiscal ruination of the Outlaw US Empire. Some may recall Putin asking Slick Willie to join NATO in 2000. Well, it turns out that request was made once before in 1954, a fact I was unaware of until today. One must ponder the reasons why Molotov's request was nixed in 1954 despite willingness to negotiate regarding the stated objections. I wonder if Ike was even informed of this development given the extremely evil Dulles brothers were in charge of State and CIA at the time. I'm sure I'm not the only one who missed the revelation of that fact. It appears the elimination of Russia as a nation-state has always been the goal, just as it was for the British. Re: Lysias @11 Do the warmongers think that nuclear winter is bogus? and Anne Jaclard @ 15. Yes, Anne Jaclard is correct.US political and military leaders have either ignored or rejected the peer-reviewed studies on the long-term environmental consequences of nuclear war. They don't fit the agenda. "Green left should try to activate remaining networks while drawing younger people into the cause of peace: advocating leaving EU, NATO, and ditching nuclear systems. We'll be called Putin's useful idiots but better that than believe in the goodness of an Empire ran by Gold Plate McDonalds "Dotard" Trump." I agree with you but having watched their MEP's recently I have to report that the Greens are both entirely up their own arses with PC snowflakery and also jumping eagerly onto the "blame Russia" bandwagon. Here in the UK, Caroline Lucas our only Green MP, is disgracing herself similarly. Sorry to say but there is no help coming from that direction. The rods from god cannot work not because they have to be big but because such projectiles would not be able to transfer enough energy to the target to create a devastating impact. Yes, if a tank was hit then it can destroy the tank and that would be about it. Against most targets it would just puncture the target and go on to get itself buried deep in the soil. As the contact surface would be very small. On the other hand, if the surface is made big like a cannonball, then atmospheric friction would melt it away while descending to the target making its impact mass much smaller hence the same result. So, for it to work it must be massive like a meteor and more resilient to heat than the rocks that the meteors essentially are. "My own personal assessment of the state of the nuclear danger today is that it is profound. The United States is sleepwalking towards nuclear war. Our leaders have turned a blind eye to the scientifically predicted consequences of nuclear war, and our military appears to be intent on making “Russia back down.” This is a recipe for unlimited human disaster." As you probably know, Putin has said Russia is ready and will not back down, that it is up to the Outlaw US Empire to alter its aggressive, provocative behaviors and policies. Brinksmanship is clearly occurring, but as you observe, there's no discussion of that fact happening within the Outlaw US Empire; although now with the INF Treaty pullout, a few voices in Europe are finally being raised. The US doesn't have a shuttle program anymore. The only way to get to the Space Station (and back) is via Russian rockets - and Russia stated that when the current contract expires (somewhere this year), they will not renew it. Why do you think somebody drilled a hole in the ISS just hours before that announcement? Pfftt. Trumps aim is simply to send more dollars to the MIC , some of which will add to the 21 trillion unaccounted for. Putins “public” claim of new weapons played right into Trumps hand to get public support for more money . Putin-Xi-Trump playing us all for suckers me thinks. Each can use the “apparent” conflicts to serve their own agendas. If enemies dont exist they must be created to control the people. William R Polk writes that they war gamed nuclear conflict, and the conclusion reached was that once USA (or Russia, or now China) used a nuke, then the result would be escalation until all nukes had been used. Leaders disbelieved this result, and redid the war games over and over again, but the result was the same. It does not matter if one nation only intended a "limited" or strategic attack, escalation is inevitable, and it would be the end of human civilization as we know it. What prevents the space gun from shooting itself backward into deeper space from the recoil of firing the projectile? The 2018 National Defense Strategy produced by Mattis was published on 19 January 2018, far in advance of Putin's 1 March 2018 address, and advocated for additional expenditures beyond what was legislated. IOW, Putin's speech had no bearing on the increase in weapons procurement as such was already planned. Furthermore, it's little secret that a technological breakthrough is being counted on to recharge the Outlaw US Empire's languishing tech sector whose only viable R&D arm for decades is DARPA; thus, the call for revamping Star Wars ought to be seen as part of that effort. @31 I think it is more likely the recoil will cause it to spin around like a Catherine wheel firing off Rods from God in all directions. It will be like the Fourth of July. You can get into all kinds of detail, but the bottom line is that offense is much cheaper than defense. This was true before and probably even more true now. Unlimited range nuclear cruise missiles and underwater drones, relatively tiny hypersonic glide vehicles changing course erratically while falling out of the sky at Mach 27 (latest test) are going to be very expensive to stop if at all. If it costs you 100 million to defend yourself from a 1 million dollar missile ... well the other guy just builds more missiles. IMO LASERS would work well in Space, for zapping space-passing missiles (etc), as the low particle density wouldn’t degrade the laser’s power, and light is pretty fast and doesn’t require fuel. It could be solar-charged (or whatever other energies are harnessable out there). Focused in a very small point, it would drill or slice, depend on aiming and relative movement. @35 Maybe the Russians and Chinese could develop some lasers too and we could have dueling lasers like in Star Wars. That would be so cool to watch. @ SteveK9 with the nice summary of how the US will go bankrupt on the peons nickel trying to prop up the global elites attempt to keep R2Ping the world. I fantasize that Trump will be the bankruptcy president but he better hurry up if doing so is one of his goals. I unfortunately have to agree with some of the commenters that note that some faith breathers see extinction as preferable to folks not behaving as directed/required/expected by their mythical religious precepts. It is bad enough to see intelligent adults bringing myth based fear to the geopolitical negotiating table but the hubris is so deep as to make one wonder if humanity will ever evolve to a more humanistic social contract. I don’t know if they’d be in visible wavelengths. Which wavelengths would be best for a laser, to cut into or otherwise incapacitate a missile ? Any laser physics buffs on here ? They already have lasers. Russia declared theirs operational as I noted at 13 above. @38 You're no fun. I was thinking something like light sabers in different colours would be exciting for spectators down on earth. But I'm no laser expert. @39 Indeed they do. Thank you Karlofi. And it is named after Alexander Peresvet a warlike monk. I expect the US is working on a counter laser...the Luke Skywalker. You can get into all kinds of detail, but the bottom line is that offense is much cheaper than defense. In my opinion you've nailed it. All the defensive systems I know of are constructed like a house of cards. They're vulnerable to every kind of disruption, and against a competent opponent none of them are going to work. But never fear - there is big money in pretending to try. I used an extract from the link rather than the article title because that title is quite deceptive. Only two methods of pure defense come to mind. First would be a Science Fiction "blaster" like in Asimov's Foundation series. The closest we have to them are lasers, and present day models don't have enough power or the ability to blast through nasty weather. I suspect that tipping the interceptor rockets with small nukes would stop the hypersonic devices in their tracks. The downside of these is something called EMP, or ElectroMagnetic Pulse. High altitude bursts will probably do at least as much damage to the US as would the bombs aboard the hypersonic gliders, and quite possibly more. Because of the demands of the US Empire, the US can't play nice with the rest of the world. But some of us can most definitely make immense profits from the situation. The ABM (Anti Ballistic Missile) industry may get to join the makers of the F-35 and the barely floating new Navy ships in the drive for massive profits. the pair @4 said in part;""war is a racket" as the saying goes. it's usually less about actual capability than it is keeping all the usual suspects latched firmly on the "military industrial" teat. it's basically the world's largest welfare program disguised as "national defense" and - coupled with financial fraud/smoke and mirrors -"
Gates to hell are open, Satan’s elves know only death economy stock but backs, not the laws of physics! Just read a headline suggesting the apartheid Jewish state is wanting to join up with the ABM grifting. My calculator says that this amount of money divided by the 240 little missiles which will come as part of the deal is $1.5 million bucks. That's a lot of taxpayer dollars for something which basically doesn't work. The next link is from 2013, but I doubt if much has changed, for this Iron Dome business was always more about soothing Apartheid State civilians than actually working. Yeah, even if they've doubled the "success" rate of that Iron Dome to 10%, it's still almost as useless as teats on a rooster. @ 34 right, and the defense didn't even work; they rigged the tests. You know there's a lot of rampant insanity sloshing around when every time there's a debate about potential threats to the US, whether it starts with Russia, China, NK, or (? ), the Neocons rarely fail to include Iran. I've been wondering what's fueling their obsession, given that Iran has never threatened "Israel." The dominant factor which comes to mind is the Holocaust Conference held in Tehran in 2006 to examine the numerous inconsistencies in the Official Narrative. The conference was organised as a series lectures based on detailed research undertaken by the speaker, or a spokesman for an organisation which had undertaken research into the subject. Much of the info consisted of statistical analysis of pre & post Holocaust population factors which cast 'doubt' on the magnitude of various and varying claims made in the Official Story. At the end of the conference all of the 'papers' delivered during the conference were published online and some of them were very well researched and very persuasive. In the aftermath there were many objections from the 'usual suspects' which, instead of attempting to refute the published findings, confined themselves to smearing the convenors and participants. I found this response to be disappointing, lazy and stupid; and tantamount to an endorsement, by default, of the findings. It was NEVER the subject of public debate of any note or duration and was quickly 'forgotten' by the MSM. However, despite the forgetfulness, Iran appears not to have been forgiven. Iran has the second largest Jewish population in the Middle East after Israel. The general opinion among Iranian Jews is that Tehran accepts them and allows them to worship as they wish, though they experience some limitations and there have been violent incidents targeting Jews in the past. If a country ruled by a Muslim theocracy tolerates large numbers of Jews living in its territory, that in itself contradicts Israel's claim to be the only country in the Middle East that offers Jews the freedom, stability and security to worship as they wish. Israel offered money to Iranian Jews to move but the Iranian Jewish community rebuffed the offer, saying it considers itself Iranian first and Jewish second and its identity is not for sale. The fact that a Muslim theocratic state hosts a large Jewish community represents an existential threat to Israel. Why does Israel need to exist for then, if other countries can host Jewish communities so well that they don't feel they need to move? I remember reading several years ago that Israel offered cash incentives to the French Jewish community and that community also knocked back the offers. Since then France has had a number of terrorist attacks - guess what those have done to the French Jewish community? Iran has the second largest Jewish population in the Middle East after Israel. I forgot all about Iran's Jewish citizens but, now that you've jogged my memory, I do recall looking it up in 2006 and discovering the fact you've reiterated. It begs a lot of questions about Jewish Unity, doesn't it? We're already there, in the 'nuclear winter' except the reality's a bit different. Fukushima has steadily been leaking radioactive water into the North Pacific. The US coastal areas have seen mass die-offs of birds and fish with high levels of the Caesium marker for Fukushima. We're not freezing, we're just dying off. I dont call 12-15K Jews in a large country an existential threat to Israel. DW has a doco on youtube on Iranian Jews. The amount of Cs 137 released by the Fukushima has added insignificant amounts of radioactivity into the North Pacific. There is absolutely no way that the amount has had any measurable affect on plant or animal life in the Eastern Pacific along the US coast. If you are so inclined just compare the levels of Cs137 to that of the naturally occurring K40 in these oceanic regions (the adverse biological affects of both of those isotopes are the same). I have no idea of the contents of your previous post, you said was it censored. My own connection of the dots suggests that the culprits are the international financiers ie George Soros and the big banking dynasties and it is hardly a secret that these people are mainly Jewish. Having said that, blaming an entire ethnic group for the machinations of a very few, very rich people, is unreasonable and actually plays right into their hands. Could that be the reason you were censored? "I remember reading several years ago that Israel offered cash incentives to the French Jewish community and that community also knocked back the offers. Since then France has had a number of terrorist attacks - guess what those have done to the French Jewish community?" Yeah, there were big announcements of French Jews making Aliyah publicly to Israel. The following year many came back to France. French life being better. I feel fairly certain that the US will create their own illusion of security and then, from within that bubble, they will become even more aggressive in pursuing "regime change" and other globalist matters as countries will continue to refuse to bend to their will. We've seen how the Republicans reacted to an "apologetic" Obama when he traveled abroad: labeling him a foreigner. We've seen how the Democrats reacted to the simple act of hacking an e-mail server and publicizing the data: it's 9/11! And we've seen them respond to Trump: labeling him beholden to foreign interests. I can only see this type of thing escalating in the future. It's depressing to think about it. If the US feels like they've secured themselves against any potential missiles, there's nothing stopping them from trying to break up Russia or vaporizing the coastline of China aside from their own sensibilities. Which seem to have gone out the window entirely, based on the latest Buzzfeed coverage. I quit! We know that a "limited nuclear war" is an illusion. The effects of a nuclear accident at Fukushima have been ignored, denied, covered up or rationalized as the collateral damage of global warming/climate change. The use of "tactical" nukes will create similar effects that are also ignored. Nuclear restraint will be an invitation to a lack of restraint as this military "necessity" transforms into full blown insanity. The terminal irony is that we're already at the point of full blown insanity for failing to impose any limits on the proliferation of nuclear war fantaseis. Therefore, I quit! I refuse to participate in the generation of more verbiage on this subject. We must demand the strict control of all nuclear weapons and research through an international program of demilitarization. The first step is to take the political promoters of this madness away from the microphones. We need a full frontal assault on militarism as the true enemy of the people. To participate in discussions of the feasibility of further nuclear elaboration is to become part of the insanity. I quit! not that many years ago, no matter who you asked or where you sourced it, the consensus was pretty much that surface-to-air missile defense systems were not particularly effective. then came the war in Syria and suddenly incoming missiles were being shot out of the air with remarkable rates of success. 50%, 60%, 70%, sometimes even 100%! and this was presumably without engaging the vaunted s-300, s-400 systems. then, of course, Putin declared his new array of super-duper hypersonic missiles...against which there is presently, apparently, no defense. but then i read that Lockheed Martin was awarded a 2.9 billion dollar contract to develop Next-Generation Overhead Persistent Infrared Satellites, designed to fill the gap that exists for early hypersonic detection, and i gotta wonder. and then i think of an anomaly like the 21 trillion unaccounted for down at DOD and i try to extrapolate the limitations on R & D.
That is sound of the "new cold war," don't you know? @50 i don't think the nuclear winter scenario applies to leaks from nuke plants. takes nuclear explosions. I seem to recall something about the Strontium 90 fall out affecting such things as cow's milk (from the air above - winds, air movements and all that) from all of those nuclear tests, many down in the south Pacific, during the 1950s and 1960s. The prevailing presumption that we (the US particularly) can nuke Russia, China, North Korea - whoever - and be "safe" from any "blowback" from atmospheric sources that any of our nuclear missiles would cause is, to put it mildly, delusional twaddle. Not only Strontium 90, but so far as I'm aware, Chernobyl's meltdown also spread airborne radioactive stuff. Following that incident, in places like the former East Germany thyroid diseases including cancer rose markedly. And if I remember right the Scandinavian countries were concerned about the possibility (or reality) of airborne radioactive materials blowing toward them from Chernobyl. While the US, UK, FR and IS all have nuclear weaponry, why would any other nation in their (gun)sights give up their own arsenals, however small? Libya stands as a lesson to nations like NK. And for the US to demand NK's denuclearization while maintaining nuclear submarines and the like nearby, is arrant, hubristic hypocrisy. From a technical point of view, he (Stanley Kubrick) anticipated many things. … Since that time, little has changed, honestly. The only difference is that modern weapons systems have become more sophisticated, more complex. But this idea of a retaliatory strike and the inability to manage these systems, yes, all of these things are relevant today. It (controlling the systems) will become even more difficult and more dangerous. Putin, after viewing Dr Strangelove when interviewed by Oliver Stone. Don't forget the chlorinated chicken! At the Counterpunch site is a takedown of Donald Trump and his “war cabinet”. I knew there had been cheating going on, but not that it had been quite this bad. "I knew there had been cheating going on, but not that it had been quite this bad." In this kind of corporate-controlled hierarchy (which is more or less every hierarchy), how could there not be cheating, whatever level of cheating is necessary to give the desired result. In this case there's tremendous pressure on those conducting the war game to set it up so it produces the result wanted by the weapons contractors: The government should buy these systems. Personnel are selected according to their sincere belief in this framework. They don't even consider it cheating, but the rightful way of the world. And if someone is enough of a rogue (they'll consider HIM the rogue) to want a "real" answer, he'll just be replaced by someone who believes in the corporate imperative. It's the same as how most STEM types sincerely believe science exists to serve corporate imperatives. Thus for example every system-conducted food safety test is designed to give the result desired by agribusiness. And if against the odds the test gives adverse data, researchers have multiple rationales for excluding it as "irrelevant". And of course that kind of manipulation is so rife in drug trials that even the mainstream media couldn't keep it from becoming a public scandal. They're still keeping the lid on the systematic fraud of food testing though. So it's no wonder that capitalism reaches exactly the end point its critics always forecast - extremely expensive weapons that don't work, extremely expensive drugs that don't work and are often harmful, extremely expensive food (artificially kept cheap at the retail checkout via massive government subsidies) that doesn't work (poor nutritional value, empty calories) and is loaded with poison. So the ticking clocks are in a race. What'll it be, nuclear war, mass death from poisoned food, mass death from the generally toxified environment. And a big part of it is that under late capitalism, professional cadres not only have no integrity but are devout believers in the religion of corporate rule and how from these benevolent despots manna will trickle down to all. But the only real trickling down is the acid rain, the volatile pesticide and radiation fallout, and the missiles. Liberal part of American elite never formulated a coherent rebuke to the insanity of Star Wars. The assumptions of Star Wars are too close to their common wisdom, namely that USA should pursue what it richly deserves, the position of an unquestioned sole superpower on the globe that sets the rules for the rest, at collects some tribute from the lesser in the form of fines for violation of the rules that are imposed on the rest. MAD does not have place is such a world so should be eliminated. The concept that pursuit of this ideal is futile, expensive and diverts energies and minds in USA from solving actual life problems of Americans, not to mention those in other nations is alien to our elite thinking. We are the force for good, so the stronger our force the better. In the meantime we have problems like this one. Moscow subway is very proud that its system expands by 5-10% every year and the percentage of delayed trains is 5 times smaller than in Paris. They do not compare themselves to NYC where the subway system hardly expands and the percentage of delayed trains is about 30% rather than 1% in Paris and 0.2% in Moscow. NYC system also consumes an amazing amount of money. The arts of corruption, mismanagement and achieving very little for a lot are more widely spread than MIC. Tehran's Evin prison following the end of the Iran-Iraq war. Mehdi Hashemi's alleged involvement may well have been instrumentalized by forces loyal to Hashemi Rafsanjani, Montazeri's sworn enemy and leader of Iran's "moderate" faction...the very faction then prepared to work with the US. The same faction that would have authorized the famous clandestine visit to Tehran of Oliver North and Co., carrying as a gift matched revolvers from Ronald Reagan. Don't know why there is a sudden rash of ABM stores, but they are surely a lot of them out there. The Defense One site has two! This first one is more of an editorial telling why the whole idea is generally a bad one. The notion of multiple F-35s loitering over China and Russia waiting to kneecap rockets during liftoff is a fantasy. When I read that new " Missile Defense Review" report this is one of the absurd claims which had me shaking my head. The F-35 isn't invisible. In the unlikely event it could even reach enemy launch sites, a good radar would know it was there. A keen set of eyes or ears could possibly hear the howl of the engine or just spot it. And a VERY average infra-red detector could detect that super-hot engine. One of the many problems with the airplane is its short range. Even if it could somehow get there, it can't stay. The plane will need fuel. The pilot will need to eat, potty, and eventually sleep. Build a special hyper-expensive robot model and it still won't work. But the neocons seem to have sold it to President Gullible, and that's all that matters. The kinetic weapons aren't a cost issue. A single Tomahawk is $1M - nor do you need a telephone pole sized projectile to do a lot of damage. The real issue is targeting and survivability. Hitting something from even low earth orbit is non-trivial, particularly if it is a purely ballistic system unless the target is both stationary and very large. And, as the author mentions, these systems are notably easy to hit if low earth orbit. I wouldn't worry about the US military capabilities anymore. There is steady erosion across the board, from quality of personnel to the capabilities of weaponry. While still formidable, America's forces are becoming less so with each passing year. In all face-to-face mock-up competitions, American soldiers, sailors and airmen always finish next to last. Every invitation by Russia to participate in such exercises (from Aviadarts to Tank Biathlon to Army Games) is invariably declined by the Pentagon, lest it leads to an embarassing display of borderline incompetence. Russia, on the other hand, is improving rapidly in all areas. Add to it the yawning gap in fiscal health (Russia is as sound as the US is sick), and it's getting clear that all of Trump's posturing is nothing but a desperate bluff. It worked once by inducing outright panic into the decrepit Soviet leadership in the late 1980s, so why not try it again...? Putin is no Brezhnev, however. And America is a very different country also (not in a good way). Nothing of substance will come of it this time around. Russians are already preparing for the inevitable collapse of the START treaty. They will be going back to tens of thousands of strategic nukes and beyond, until the West either collapses or sues for peace. Fallout from Chernobyl rendered Welsh sheep too radioactive to eat for a good many years. Recently, (last couple of years) I was told by a Bavarian that they still could not eat wild boar in Bavaria for the same reason. uh gorbachev (not brezhnev) was not "panicked" by the fake star wars program, he genuinely wanted to end the soviet system. wish americans were as realistic as gorbachev. To get the signal to make the short leap to the spacecraft, the Russian researchers propose blasting the resonating plasma layer with radio waves generated from the spacecraft. Like the signal from earth, some will be absorbed and some reflected back to the spacecraft. But the reflected waves should be modulated by changes in the electric field caused by the signal sent from earth. Meaning the signals returning to the spacecraft should carry a ghost of the signal sent form earth and absorbed by the plasma. A search turned up several different proposals, so person has to assume one or more of them is going to work. One reason to worry about this is the possibliity of attacking missile silo ICBMs. Until very recently it was thought only a nuclear weapon would destroy one of these, but a properly sized kinetic impactor would surely do just as well. Worst of all, the warning time from when the impactors were detected on radar until they hit would be really short. There are other possibilities which had best be left untouched in deference to the sensitivities of The Surveillance State. can be declared capable of bringing together teams of people with right qualificatiins to “innovate”. absence of Russian naval development. It was just written off as the Soviet legacy. is not a torpedo, but a sub drone that is armed with conventional or nuclear weapons. nuclear engine 100 times smaller then standard sub, and capable of coastal targeting as well. Pacific. My, this is a problem — how to reassure allies, without promissing impossible. I'm sure the owners of the M-IC Gravy Train are delighted by the prospect of building more hyper-super-duper missile systems and space-based gizmos and whirligigs. But modern H-bombs are small enough to fit inside a shipping container. And many hundreds of shipping containers end their days lost on the bottom of the ocean each year. Their ubiquity as familiar objects makes them a far more practical and cheap way to deliver a Nuke close to a juicy target, than a noisy, smokey rocket. And it can be warehoused on land, or underwater, near the target until it's needed. A shipping container is just one of hundreds of common mobile artifacts, and thousands of semi-mobile and fixed artifacts, which could accommodate a Nuke. Nukes should be dismantled and scrapped. And anyone who opposes the idea should be dismantled and scrapped too. - Now I understand where all those billions and billions of new (military) spending will go to. - Based on my info the US government wants to increase the "defense" spending by some 700 billion in the next 10 years. Sheer insanity. But modern H-bombs are small enough to fit inside a shipping container. It probably can be detected with ease by customs. But what can one do after the detection if it has a mechanism to detonate it if you move it away or tamper in any way? "Instruction: place the container in an undisturbed location less that 3 miles away and do not start a war." BTW, a countermeasure for silo destroying weapons was discussed decades ago. You have, say, 1000 ICBMs. You make 10,000 silos and 9,000 decoy ICBMs. On regular basis you move the ICBMs by truck from one silo to another, a gigantic shell game. A silo is orders of magnitude less expensive than a missile capable of destroying the silo, what you need is some vast terrain (Russia has it) and dirt roads (actually, if you are content with moving decoys and ICBMs only in winter, you do not need to build roads, just harden the snow by spraying water. Winter in tundra is 6-10 month long). Mind you, the silos have to be merely strong enough and spaced far enough that you cannot destroy two of them in one shot.